Or Don't Sail At All! Rocky shoals, tree covered islands, and beautiful sunsets provide an exhilarating view and memories that will last a lifetime. So grab a camera, your sunglasses, and anything else to make yourself feel at home as you sail on the Door's sparkling green and blue waters. Feel free to pack your picnic basket. You are welcome to bring anything you want on board to eat or drink! Parasail Door County - Summer 2018! We are pleased to announce the opening of our partner company, Parasail Door County! Flying for the first time (with experienced captains and crew) summer 2018. Fly solo or tandem in groups of two or three and experience Door County from new heights. Climb aboard our 6 passenger, 40 foot sloop, the Passage North, for a classic sailing experience! The corvette of sailboats, our Cal 40' is perfect for those looking for a luxurious day on the water. 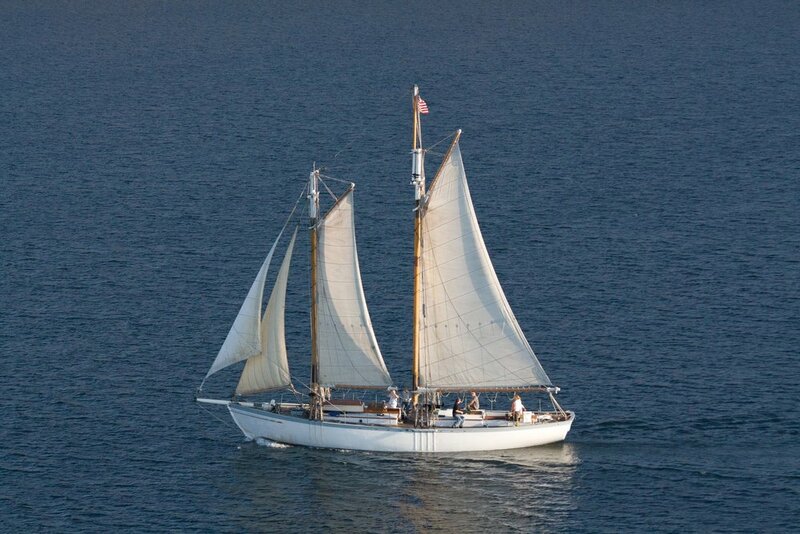 Join us on the decks of our 23 passenger, 65 foot schooner, The Edith M. Becker for a one-of-a-kind sailing adventure! Heave a halyard with the crew or sit back and relax while we tell you about our 18th century inspired vessel. The consistency of Door County's wind provides a sail for everyone. Our morning sail welcomes the day's breeze and the sun's warmth. The afternoon sail is just as exhilarating as the warm currents descend on the bay from the tree covered bluffs. For those looking for that perfect sunset, your search is over. Join us on your sunset cruise as we toast to the twilight under the sinking sun. Yes there is something for everyone, but if you're like most visitors, once is not enough! 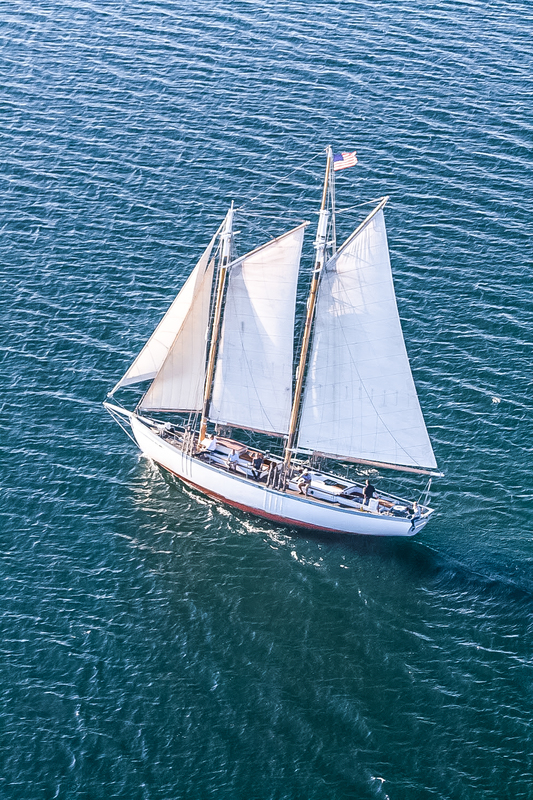 And learn about the fascinating history of our tall ship, the Edith M. Becker, as we sail along the breathtaking bluffs of Door County. Sail Door County was founded in 1999 and has been operated by the same, close knit group of people throughout operation. We are committed to being the best part of your visit to Door County! Join The Sail Door County Family! Be the first to know about special offers, events, discounts, and contests! We respect your privacy. We won't share this information with anyone. Captain and crew are included in your sail. No sailing experience or knowledge is necessary. Our boats are safe, sturdy, and smooth, and our captains are skilled and experienced so you don't have to be! We're family friendly and accommodating! Bring your grandparents, great-grandparents, kids, and infants. And don't forget that we welcome your furry friends! Dogs always sail for free! We are very pleased to welcome our partner company, Parasail Door County to the beautiful waters of Green Bay. Flying out of Sister Bay in Door County hourly, 7 days a week! Ask about our special discount when you book both activities! A Door County sunset is deemed to be second to none. Pictures of relatives, friends and Door County's shoreline on a sunset tour as we toast to the twilight under a setting sun and rising moon. Shooting pictures on our traditional Tall Ship is an experience to cherish with photos that will last a lifetime. For lots of people from the Midwestern States, fall in Door County is the most ideal time of year for visiting the Door Peninsula. The fall colors draw people from all around and are incomparable when viewed from our tall ship! Tying The Knot With Sail Door County! Looking for an intimate, private, and incomparably unique wedding venue? Join us on the decks of our historic wooden sailboat and tie the knot! Our crew will work with you to customize your event. Don't forget to commemorate your adventure with us! The Sail Door County shop is coming soon. Tag us in your photos and videos, and we might just feature you on our pages! Whether you're a small group or celebrating a family reunion, we are happy to accommodate your private parties. We offer customized private sailing charters on both our 40-foot, 6 passenger sloop and our 65-foot, 23 passenger schooner. Please bear in mind that these passenger counts are set in stone by the coast guard and we cannot sail above capacity. We are happy to be a part of your anniversary, birthday party, or even your engagement (just make sure you tell us first so we don't give the surprise away)! with any further questions! We look forward to hearing from you. And we look forward to sailing with you!